If you are looking to compete with faster feet and more explosive body control then our Speed and Agility Ladder will be a great addition to your training. With hundreds of different step sequences you will add variety to your workouts and build foot speed fast. Just 15 minutes 2-3 times a week is all you need to begin changing the way you move with the Speed and Agility Ladder. 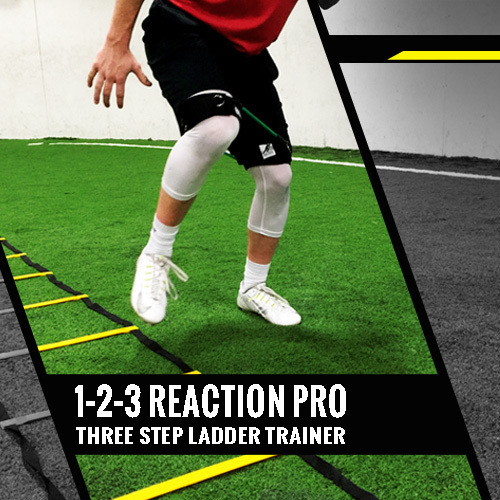 In addition to your Speed and Agility Ladder you will receive 1-2-3 Reaction Pro. This program is a complete ladder trainer sure to give you big results. Utilize the power of Kbands to enhace your results training with the Speed and Agility Ladder. Throughout every resisted ladder drill you will optimize your results building foot speed and lateral quickness. Combine resisted and un-resisted sets to optimize muslce activation for enhanced results. Enhance both lateral and linear muscle activation. Build hip strength while building foot speed. Feather like feeling with un-resisted sets. Every Kbands Speed and Agility Ladder comes with our complete 3 step ladder training sequence 1-2-3 Reaction Pro. With a combination of high knee movements both forward and laterally you will build hip flexor strength for improved running speed. Next you will focus on dynamic quick step movements to improve foot speed in high traffic areas. Finally you will finish your training session improving one legged power and control.